Professor, CVAS, Mannuthy from 5.6.15 continuing. 1. Lucy Sabu, Bindu Lakshmanan and K. Devada. 2019. Re emerging zoonotic helminth infections in Kerala- an update. JIVA. 16: 64-71. 2. Shameem H, Devada K., Lakshmanan, B., Joseph, S., Sabu L. and Usha A.P. 2018. Morphological and molecular characterization of common amphistome species from cattle of South India. J Vet. Med. Allid Sci. 2: 1-11. 3. 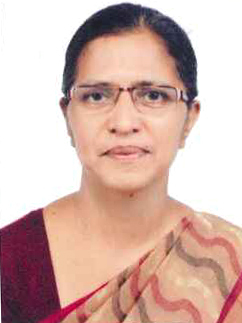 Bindu Lakshmanan., K. Devada., Siju Joseph., T.V. Aravindakshan and Lucy Sabu. 2017. Molecular characterisation of snail borne trematodes in dairy cattle of Kerala. Life Sci. Int. Res. J. 4: 72-75. 4. Hitaishi V N., Bindu Lakshmanan., Shameem H., Praveena E Jose., Jain Jose and Lucy Sabu. 2017. Int. J. Sci. Envir. 6: 1979-1984. 5. Shameem H., K. Devada., B. Lakshmanan., S. Joseph., L. Sabu and A P. Usha. 2017. Standardization of a coproantigen sandwich ELISA for early immunodiagnosis of amphistomosis in cattle. Ind. J. Com. Microbiol. Immunol Infect. Dis. 38: 10-15. 6. R. Radhika., Lucy Sabu and S. Krishnan. 2017. Prevalence of coccidiosis in cattle in different agroecological zones and of Kerala. 2017. J. Agromet. (Spl issuue) 132- 134. 7. B. Lakshmanan., K. Devada., S. Joseph., T.V. Aravindakshan and L. Sabu. 2015. Copro- PCR based detection of bovine Schistosome infection in India. J. Helminth. 11. Sneha Augustine and Lucy Sabu. 2013. Epidemiological and vector studies on canine babesiosis. J.Vet. Anim.Sci. 45: 43-46. 19. Lucy Sabu. 2011. Mosquito species associated with cattle sheds. Ind. Vet. J. 88: 96-97. 20. H.Shameem, H.Subramanian, K.Devada and Lucy Sabu. 2010. Anticoccidial effect of certain herbal formulations in chicken coccidiosis. J. Vet. Parasitol. 24: 79-81. 27. Lucy Sabu, P. G. Baby, S. Ajith Kumar, and K. Devada. 2002. Babesia canis infection in young pups. INTAS POLIVET. 3: 129-130. 28. Lucy Sabu, K.Devada. H. Subramanian. and Jacob V. Cheeran. 2002. Diploscapter coronata (Cobb, 1893) infestation in captive snakes. Zoo’s PrintJ. 17(12): 954-956. 29. Lucy Sabu. 2002. Canine Babesiosis. JIVA. 7: 12-14. 30. A. Gigi George and Lucy Sabu 2002. Evaluation of amprolium hydrochloride, monensin and salinomycin as coccidiostats in broiler chicken. Ind. J. Poul. Sci. 37: 159-162. 31. Lucy Sabu. 2001. Mite infestation in cattle and buffaloes. JIVA 6: 46-48. 32. Lucy Sabu, Devada, K., AjithKumar,S and Jayakumar,K.M. 2001. Occurrence of Haemobartonella felis in a kitten. Polivet. 2:69-70. 33. Gigi George. A and Lucy Sabu. 2001. Incidence of Coccidiosis in broiler chicken in Thrissur, Kerala. Cheiron.30: 49-51. 35. Lucy Sabu., Pillai,K.M. 1996. Amprolsol, Sulmet, Coxysol-A.K and Metrogyl in the treatment of caprine coccidiosis. Kerala J. Vet. Sci.. 27: 141-144. 36. Lucy Jacob and Pillai, K. M.(1991). Incidence of parasitic infection in dogs in Thrissur, Kerala. Kerala J. Vet. Sci. 22: 149-150. 37. Lucy Jacob, Pillai, K. M. and Rajamohanan, K. (1990). Entamoeba bovis infection in a calf. Kerala J. Vet. Sci. 21: 150- 151. 38. Lucy Jacob and K.M. Pillai.1989. Clinical pathology of coccidiosis in goats. Kerala J. Vet. Sci. 20: 97-103. 39. K. M. Pillai, H. Subramanian and Lucy Jacob. 1989. Cystacanth of Moniliformismoniliformis (Acanthocephala) in cockroaches (Periplanetaamericana). Kerala J. Vet. Sci. 20: 155-156. 40. Lucy Jacob and Pillai, K.M. 1988. Occurrence of Eimeriacaprina from goats in Kerala. J. Vet. Parasitol. 2: 141-143.